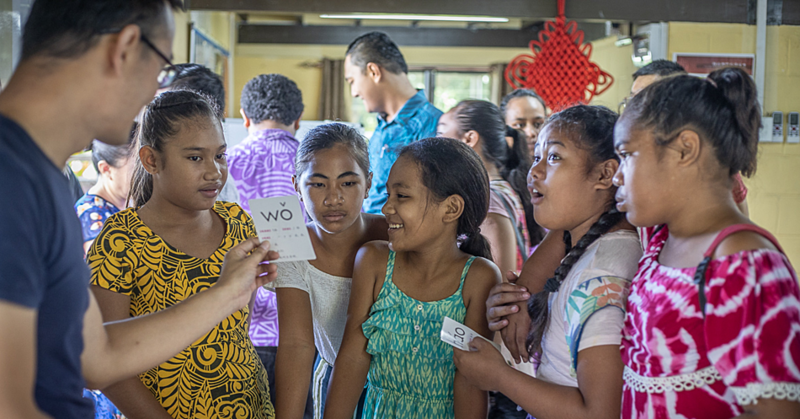 Manamea’s art exhibition “ The New Samoa: Samoa Fou” officially opened yesterday evening to the public at their studio in Vaigaga. 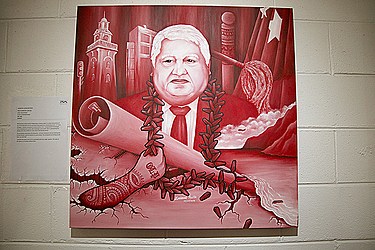 A principal painting in the collection by artist Lalovai Peseta, features a portrait of Prime Minister Tuilaepa. In a ‘life imitating art’ moment, special guest Prime Minister Tuilaepa arrived to the surprise of guests at the Vaigaga gallery. The Prime minister walked around to view the exhibition and upon seeing his portrait for the first time broke into a wide smile. 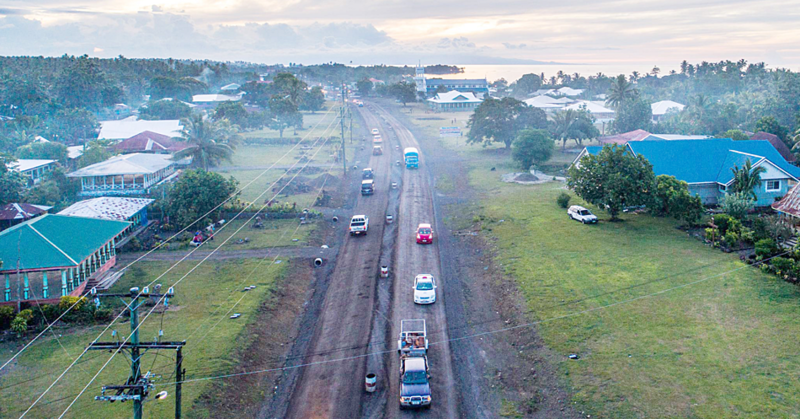 The Prime Minister’s image is depicted being challenged and obstructed by the arm of the controversial political blogger ‘O le Palemia’ against a back drop of some of the major changes that Tuilaepa has implemented in Samoa during his tenure as Prime Minister. Speaking to the Samoa Observer, artist Lalovai Peseta discussed what moved him to express his views on the combative nature in the relationship between the current government administration and the controversial blogger. “It’s not just the P.M, it’s about how individuals are treated badly on social media. We all understand that all developments come with problems and the idea came to my mind when I saw that O.L.P. was harassing people online. 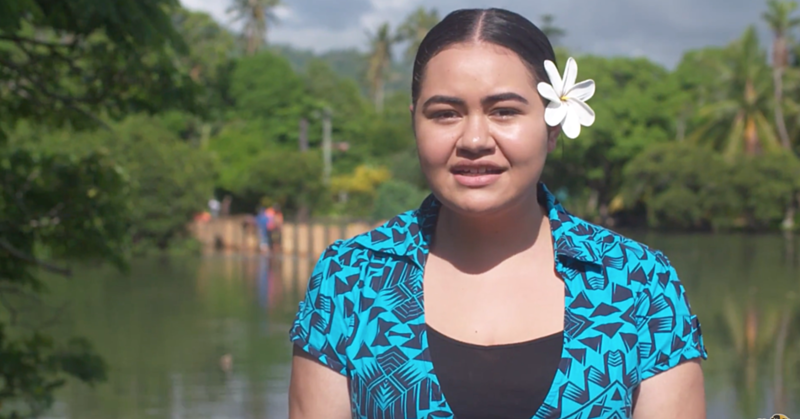 “Not everybody is perfect but Tuilaepa has been developing Samoa in a good way from my perspective compared to when I was growing up – there wasn’t much here but now we are more developed than ever. “The way people are disrespecting him.. but don’t get me wrong, it’s good to be challenged because that’s how ideas come out… but the way that O.L.P. is doing it– we don’t know who they are..
“I painted the O.L..P coming from the cracks of the land because that’s one of the most talked about issue right now is land rights. All paintings are for sale and the exhibition will be running for a week at the Manamea Art studio. All are welcome with free entry and there will be a chance to meet the artists at 5pm this Saturday.